Whales and dolphins (cetaceans) are divided into two suborders – baleen whales (mystecetes) and toothed whales (odontocetes). Baleen Whales – The humpback whale is by far the most common baleen species found in Hawaiian waters, although there have been rare sightings of fin, minke, Bryde’s, blue, and North Pacific right whales as well. 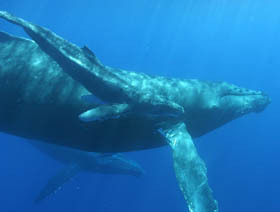 As many as 10,000 humpbacks come to Hawai‘i every year to mate, give birth and nurse their calves. Hawaii’s humpback whale season runs from November through May, with January through March being the peak whale-watching months. 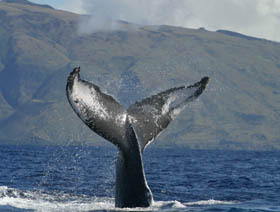 Humpback whales are provided special protection in Hawai‘i by the Hawaiian Islands Humpback Whale National Marine Sanctuary. Toothed Whales – Hawai‘i’s toothed whales range from the endangered sperm whale to a variety of smaller whales and dolphins. Commonly sighted toothed whales include pilot and false killer whales, as well as bottlenose and spinner dolphins. For more on toothed whales, visit the NOAA protected species site. Hawaiian monk seals are among the most critically endangered mammals in the world. Only about 1,200 seals are alive today. Most seals live in the Northwestern Hawaiian Islands, but there is a small and potentially growing population of seals in the Main Hawaiian Islands (MHI). A 2005 survey observed 76 seals in the MHI. Monk seals frequently haul-out on our shorelines to rest and molt. Female seals also haul-out on shore for up to seven weeks to give birth and nurse their pups. Hauled-out seals may look sick, but they are usually perfectly healthy. Please keep your distance and just let them rest. Hawaii’s leash laws apply to all beaches, so keep all pets on leash and pick up after them. Dogs have attacked seals, and they carry diseases that are potentially lethal to seals. 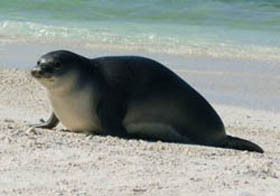 For more information on Hawaiian monk seals, visit the NOAA protected species site. Also check out this NOAA website: Hawaiian Monk Seal. To report a marine mammal in trouble (injured, stranded, or entangled whale, dolphin or seal) please call the NOAA Marine Mammal Hotline: 1-888-256-9840. Please report immediately and keep your distance, for your safety. Injured, sick or entangled animals can be unpredictable and dangerous. To report marine mammal disturbance or legal violation, please call the NOAA Office of Law Enforcement Hotline: 1-800-853-1964 and then call DLNR, Division of Conservation and Resources Enforcement (DOCARE) statewide hotline: 643-DLNR (3567). A. Most seals that haul-out on the shoreline are just fine. They may have mucus around their eyes, scars on their body, and may lie very still, as if they are not breathing, but that’s normal. Please keep your distance; do not try to get close to the animal. They need to be allowed to rest undisturbed. If you see an obvious sign of injury, such as an open wound or entanglement in rope or net, please call the NOAA hotline at 1-888-256-9840. A. Whales and dolphins on the shoreline or swimming in very shallow water (less than 5 feet) are usually sick or injured. Please keep your distance -these animals are very strong, heavy, and unpredictable – and call the NOAA hotline at 1-888-256-9840. Q. I see a marine mammal that’s entangled in rope or net – what should I do? A. Call the NOAA hotline at 1-888-256-9840. If it’s safe, please stay nearby the animal to keep track of it until a trained response team can arrive. Never try to untangle a marine mammal on your own, without permission and guidance from NOAA. Too many well-meaning people have been seriously injured or drowned while attempting to save an entangled whale, dolphin or seal. A. Please immediately call the NOAA hotline at 1-888-256-9840. You will then be given guidance over the phone on what to do depending on the situation. Review NOAA’s fisheries interactions guidelines for more information on how to avoid seal interactions. A. Hawaiian monk seals are native to the Hawaiian Islands, and occur nowhere else in the world. Though most monk seals are currently in the NWHI, rare sightings were recorded in the Main Islands in the early 20th century (beginning in 1928) and there is good archaeological evidence that monk seals were here hundreds of years ago. Seals usually feed on bottom-dwelling creatures, such as eels, flatfish, wrasses, octopus, and crustaceans. Seals have never been observed hunting pelagic fish, such as mahi-mahi, ahi, aku, etc. Like sharks and other marine predators, seals play an essential role in our reef ecosystem, maintaining a balance that allows for the highest levels of productivity in our local fisheries. Q. How close I can get to a humpback whale? A. Federal law states that no one may approach a humpback whale within 100 yards in Hawaiian waters. This means that all ocean users (boaters, swimmers, surfers, etc. ) must stay at least 100 yards from any humpback whale at all times. NOAA and DLNR issue a very limited number of special permits to researchers and rescue personnel to get closer than 100 yards. If, while on the water, you find a whale closer than 100 yards to you – if a whale approaches you, for instance – NOAA asks that you remain stationary and wait for the whale to move away. If you are in a motorized vessel, please put your engine in neutral (do not turn it off), and wait for the whale to move away. For more information about whale watching rules and guidelines in Hawaii, please visit the HIHWNMS whale guidelines web page. Q. How close can I get to whales, dolphins, and monk seals? A. Except for humpback whales (see above), there is no law specifying the minimum distance people can approach a marine mammal. However, getting close to these animals may constitute a federal or state violation if the animal is disturbed or if your action has the potential to disturb its natural behavioral patterns. NOAA and DLNR recommend, for your safety and the animals’ protection, that everyone stay at least 150 feet from all marine mammals. If maintaining this distance isn’t possible, keep safety in mind and move away from the animal as carefully as possible, avoiding sudden movements and other actions that might disturb the animal. For wildlife viewers, please enjoy from a distance – use binoculars and telephoto lenses to get the best views without disturbing the wildlife. If you don’t like it, what makes you think they do? Humpback whales are protected in the Hawaiian Islands Humpback Whale National Marine Sanctuary under the National Marine Sanctuaries Act (NMSA). The sanctuary is co-managed as a federal-state partnership by the Hawaii Department of Land and Natural Resources and NOAA, National Ocean Service, Office of National Marine Sanctuaries. Marine mammals listed as endangered or threatened species, including humpback whales, sperm whales, and Hawaiian monk seals, are protected under Hawai‘i Revised Statutes, Chapter 195D and Hawai‘i Administrative Rules, 13-124.